The lost history of a dictator-loving, Nationalist-supporting American oilman. “Merchants have no country,” wrote Thomas Jefferson in 1814. “The mere spot they stand on does not constitute so strong an attachment as that from which they draw their gains.” The former president was ruing the way New England traders and shipowners, fearing the loss of lucrative transatlantic commerce, failed to rally to their country in the War of 1812. Today, with the places from which “merchants” draw their gains spread across the planet, corporations are even less likely to feel loyalty to any country in particular. Some of them have found it profitable to reincorporate in tax havens overseas. Giant multinationals, sometimes with annual earnings greater than the combined total gross national products of several dozen of the world’s poorer countries, are often more powerful than national governments, while their CEOs wield the kind of political clout many prime ministers and presidents only dream of. No corporations have been more aggressive in forging their own foreign policies than the big oil companies. No corporations have been more aggressive in forging their own foreign policies than the big oil companies. With operations spanning the world, they—and not the governments who weakly try to tax or regulate them—largely decide whom they do business with and how. In its quest for oil in the anarchic Niger Delta, according to journalist Steve Coll, ExxonMobil, for example, gave boats to the Nigerian navy, and recruited and supplied part of the country’s army, while local police sported the company’s red flying horse logo on their uniforms. Jane Mayer’s new book, Dark Money, on how the brothers and oil magnates Charles and David Koch spent hundreds of millions of dollars to buy the Republican Party and America’s democratic politics, offers a vivid account of the way their father Fred launched the energy business they would inherit. It was a classic case of not letting “attachments” stand in the way of gain. Fred happily set up oil installations for Soviet dictator Joseph Stalin before the United States recognized the Soviet Union in 1933, and then helped Adolf Hitler build one of Nazi Germany’s largest oil refineries that would later supply fuel to its air force, the Luftwaffe. His unsavory tale is now part of the historical record, thanks to Mayer. That of another American oil tycoon of the 1930s, who quietly lent a helping hand to a different grim dictator, has, however, gone almost unnoticed. In our world where the big oil outfits have become powerful forces and his company, Texaco, became part of the oil giant Chevron, it’s an instructive tale. He helped determine the course of a war that would shape our world for decades to come. From its beginning in 1936 until it ended early in 1939, some 400,000 deaths later, the Spanish Civil War would rivet the world’s attention. For those who no longer remember, here’s a thumbnail sketch of what happened. A group of right-wing army officers calling themselves Nationalists, with a ruthless young general named Francisco Franco emerging as their leader, went into revolt against the elected government of the Spanish Republic. They fought with a brutality that would soon become far more common and global. Newspapers around the world reported on the deadly aid that Franco received from Nazi Germany and Fascist Italy. Squadrons of aircraft on loan from Adolf Hitler infamously bombed the town of Guernica into ruins and leveled whole blocks of Madrid and Barcelona, killing thousands of civilians, something that was shockingly new at the time. By war’s end, Italian Fascist dictator Benito Mussolini had dispatched 80,000 Italian troops to fight for the Nationalists. Hitler and Mussolini would supply them with weaponry ranging from the latest tanks and artillery to submarines. Totally ignored by the world’s press, however, would be one of Franco’s crucial allies, a man who lived neither in Berlin nor Rome. With a globe on his desk and roll-down maps on the wall of his elegantly wainscotted office, he could be found high in the iconic Chrysler Building in the heart of New York City. Not one of the hundreds of foreign correspondents who chronicled the bombing of Madrid looked up at the ominous V-shaped formations of Hitler’s bombers and wondered: Whose fuel is powering those aircraft? The oilman who supplied that fuel would, in fact, prove to be the best American friend a Fascist dictator could have. He would provide the Nationalists not only with oil, but with an astonishing hidden subsidy of money, a generous and elastic line of credit, and a stream of strategic intelligence. At the age of 22, having survived a knifing by a drunken crewman, he would be naturalized as an American citizen and become the captain of an oil tanker. Forever after, his friends would call him “Cap.” The tanker he commanded was later bought by the Texas Company, better known by its service station brand name, Texaco. That was when he realized that, in the oil business, the biggest money was to be made on dry land. As the company expanded and the red Texaco star with its green “T” spread to gas stations across the world, he would marry his boss’s secretary and climb the corporate ladder to become, in 1935, CEO. For the company, Rieber muscled his way into oilfields around the world, making deals with local strongmen. In Colombia, a new city called Petrólea arose in the midst of the Rhode Island-sized expanse of land where Texaco had won the right to drill. To pump the oil to a port where tankers could collect it meant building a 263-mile pipeline across the Andes at Captain Rieber Pass. Beneath his broad shoulders, iron handshake, sailors’ oaths, and up-from-the-lower-decks persona, however, lay something far darker. Although not particularly anti-Semitic by the standards of the time—”Why,” he would say, “some of my best friends are goddam Jews, like Bernie Gimbel and Solomon Guggenheim”—he was an admirer of Adolf Hitler. In 1935, the Spanish Republic signed a contract with Rieber’s Texaco, turning the company into its major oil supplier. The next year, after Franco and his allies made their grab for power, however, Rieber suddenly changed course and bet on them. Knowing that military trucks, tanks, and aircraft need not just fuel, but a range of engine oils and other lubricants, the Texaco CEO quickly ordered a supply at the French port of Bordeaux to be loaded into a company tanker and shipped to the hard-pressed Nationalists. It was a gesture that Franco would never forget. From Nationalist officials came messages explaining that, much as they urgently needed Texaco’s oil for their military, they were painfully short on cash. Rieber instantly replied with a telegram—”Don’t worry about payments”—that became legendary in the dictator’s inner circles. Not surprisingly, soon after that, he was invited to Burgos, headquarters of the Nationalist insurgency, where he promptly agreed to cut off fuel sales to the Republic, while guaranteeing Franco all the oil he needed. Few were paying the slightest attention to where Franco’s bounteous supply of oil was coming from. Not a single investigation on the subject appeared in any major American newspaper at a time when the civil war in Spain was front-page news almost daily. Yet the question should have been obvious, as more than 60% of the oil going to both sides in the bitter conflict was being consumed by the rival armed forces and Germany and Italy were incapable of offering Franco any oil, since both were petroleum importers. The US neutrality legislation of the time made it difficult for American corporations to sell even non-military goods to a country at war, and posed two major obstacles for Franco’s Nationalists. The law banned such cargo from being transported in American ships—and the Nationalists had no tankers. In addition, it was illegal to supply a warring country with credit—and the Nationalists had little money. Spain’s gold reserves were in the hands of the Republic. It didn’t take long for American customs agents to discover that Texaco tankers were breaking the law. They would leave the company’s pipeline terminal at Port Arthur, Texas, with cargo manifests showing their destinations as Antwerp, Rotterdam, or Amsterdam. At sea, their captains would open sealed orders redirecting them to ports in Nationalist Spain. Rieber was also violating the law in yet another way—by extending credit to a government at war. Nominally, the credit was for 90 days (startlingly lenient terms for the oil business of that era). The real terms were far more generous. As one Nationalist oil official later explained, “We paid what we could when we could.” In effect, an American oil company CEO had become Franco’s banker. Unknown to American authorities, Texaco was also acting as a purchasing agent when the Nationalists needed oil products not in the company’s inventory. FBI agents did indeed question Rieber about those tankers, but President Franklin D. Roosevelt was leery of getting drawn into the Spanish Civil War in any way, even by prosecuting such a conspicuous violation of American law. Instead, Texaco received no more than a slap on the wrist, eventually paying a fine of $22,000 for extending credit to a belligerent government. Years later, when oil companies began issuing credit cards to consumers, a joke began making the rounds among industry insiders: Who did Texaco give its first credit card to? Francisco Franco. President Roosevelt continued to maintain a studied neutrality toward the Spanish Civil War that he would later regret. Texaco, on the other hand, went to war. In recent years, in the archives of the Nationalist oil monopoly, a Spanish scholar, Guillem Martínez Molinos, made a discovery. Not only did Texaco ship its oil illegally to Franco, but that oil was priced as if the Nationalists had transported it, not the company’s fleet of tankers. Nor was that the end of the gifts Rieber offered. Mussolini had put Italian submarines in the Mediterranean to work attacking ships carrying supplies to Republican Spain. Franco had his own vessels and planes doing this as well. Commanders directing these submarines, bombers, and surface ships were always remarkably well informed on the travels of tankers bound for the Spanish Republic. These were, of course, a prime target for the Nationalists and during the war at least 29 of them were either damaged, sunk, or captured. The risk became so great that, in the summer of 1937, insurance rates for tankers in the Mediterranean abruptly quadrupled. One reason those waters became so dangerous: the Nationalists had access to Texaco’s international maritime intelligence network. The company had offices and sales agents across the world. Thanks to Rieber, its Paris office began collecting information from port cities about oil tankers headed for the Spanish Republic. His Paris associate William M. Brewster coordinated this flow of intelligence, passing on to the Nationalists data he received from London, Istanbul, Marseille, and elsewhere. Brewster’s messages often listed the quantity and type of fuel a tanker was carrying and how much had been paid for it, intelligence that would help the Nationalists in assessing Republican supplies and finances. Whenever he could, however, he also delighted in relaying information useful to bomber pilots or submarine captains looking for targets. Rieber sometimes joked with friends that the Führer’s anti-Semitism might be a touch excessive, but he was just the sort of strong, anti-communist leader with whom one could do business. On July 2, 1937, for example, he sent a telegram to the chief of the Nationalist oil monopoly about the S.S. Campoamor, a Republican tanker a Texaco agent had spotted at Le Verdon, a French port near Bordeaux. It had covered its name, hull, and funnel with new coats of black paint, and was preparing to sail soon under a British flag. It had already twice left its anchorage and returned because of reports of Nationalist ships and submarines lying in wait outside Santander, the Republican-held port where it was supposed to deliver its cargo of 10,000 tons of aviation fuel. The news of that repainting and re-flagging would have been useful to the commanders of Nationalist naval vessels. As it happened, though, an even more valuable piece of information was included in Brewster’s message: much of the crew left the ship “almost every evening.” Four days later, with many of the crew attending a dance on shore, the Campoamor was boarded near midnight by an armed Nationalist raiding party, which quickly sailed it to a port held by Franco. Rieber traveled to Nationalist Spain twice during the war, at one point getting a VIP tour of the front lines near Madrid. By April 1939, Franco had won the war and Rieber was assured that the gamble he had made would pay off big time. Texaco’s coffers would at last receive the money for the nearly three years’ worth of fuel he had supplied on credit. In total, he sold the Nationalists at least $20 million worth of oil during the war, the equivalent of more than $325 million today. 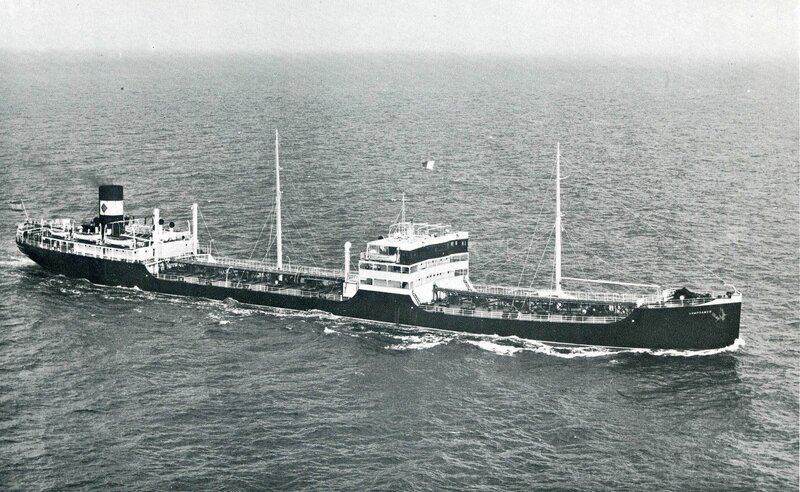 Texaco’s tankers took 225 trips to Spain, and ships the company chartered another 156. Franco later made Rieber a Knight of the Grand Cross of Isabella the Catholic, one of Spain’s highest honors. After the Spanish war ended, Texaco continued to make its own foreign policy. Even after Germany went to war with Britain and France in September 1939, Rieber made no secret of his enthusiasm for Hitler. He sometimes joked with friends that the Führer’s anti-Semitism might be a touch excessive, but he was just the sort of strong, anti-communist leader with whom one could do business. This Rieber did, with gusto, selling Texaco oil to the Nazis, ordering tankers built in Hamburg shipyards, and traveling to Germany after the Polish Blitzkrieg so that Hermann Göring could take him on a tour by air of key industrial sites. On that trip he spent a weekend at the Luftwaffe commander’s country estate, Carinhall, soon to be extravagantly decorated with art treasures looted from across Europe. Eventually, Rieber’s love of dictators got him in trouble. In 1940, it was revealed, among other things, that several Germans he had hired were Nazi spies using Texaco’s internal communications to transmit intelligence information to Berlin. Rieber lost his job, but thanks to a grateful Franco the deposed tycoon landed on his feet: the dictator made him chief American buyer for the Spanish government’s oil company. He went on to a succession of other high-paying positions and directorships in the oil industry and shipbuilding and died a wealthy man in 1968, at the age of 86. Rieber is long forgotten, but we still live in a world he had such a hand in shaping. Texaco oil helped Franco win the Spanish Civil War and so be in a position to aid the Nazis in the far larger war that followed. Untold numbers of American sailors lost their lives thanks to the 21 German U-Boats based on Spain’s Atlantic coast. Forty-five thousand Spaniards volunteered for Hitler’s army and air force, and Spain supplied an essential stream of strategic minerals to Germany’s war industry. In the United States three quarters of a century later, well-funded climate change deniers and the political network supported by the Koch brothers are testimony to the enduring power of the oil industry. Adam Hochschild, a TomDispatch regular, teaches at the Graduate School of Journalism at the University of California-Berkeley. He is the author of eight books, including King Leopold’s Ghost and To End All Wars: A Story of Loyalty and Rebellion, 1914-1918. This piece is adapted from his new book, Spain in Our Hearts: Americans in the Spanish Civil War, 1936-1939 (Houghton Mifflin Harcourt). Follow TomDispatch on Twitter and join us on Facebook. Check out the newest Dispatch Book, Nick Turse’s Tomorrow’ Battlefield: US Proxy Wars and Secret Ops in Africa, and Tom Engelhardt’s latest book, Shadow Government: Surveillance, Secret Wars, and a Global Security State in a Single-Superpower World. It’s Not Just Flint. There’s an Ugly History of Lead Poisoning and the Poor in the US. Republicans Trashed Democracy in Michigan. Now They Want To Trash It in Your State, Too.